On a bean kick! Since discovering a wonderfully easy way to cook beans for homemade fast-food creations I’ve been on a roll. Any dried beans will work to make amazing fast-food creations at home healthful and delicious: Chili Stew, Refried Beans for nachos / tacos or wraps, Taco Salad, Humus, and our all time favorite Rice & Beans w/Veggies! I’ve learned first hand that after cooking, I can drain the beans and let them cool to room temperature then spread them out on a cookie sheet to freeze for a couple of hours (by that time, for me, it’s usually overnight). Once the beans are frozen it’s easy to package in a gallon ziplock for everyday meals or package for trips and longer storage using the FoodSaver Vacuum Sealer. I cook a lot of beans, it makes it easier to enjoy a plant-based diet when there are quick, go-to items handy to make into a meal! 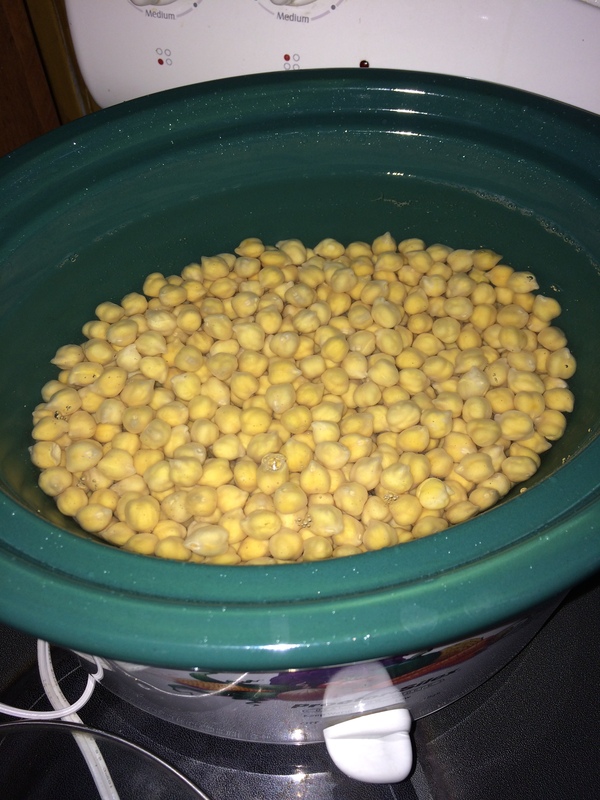 All the beans I cook use the same slow cooker method, similar to the recipe found here (which I used and modified to create my own version) and a variety of simple ingredients. One Big Thing! Don’t skip any steps like soaking or boiling! Of Note! Red Kidney Beans & White Kidney Beans (Cannelloni) have the highest concentration of phytohemagglutinin and must be boiled for 10 minutes prior to cooking in the crock pot in addition to soaking overnight (8-12 hours). A night and a day before you want to eat your beans get started! First sort and wash your beans! I am always amazed at how many rocks and broken bits are found! I like to get real into the washing part in my colander really shaking the beans about and making sure all the dirt is off of them. BTW, the higher quality beans you can buy the fewer you’ll be likely to throw away… we love to get ours from Berkeley Bowl. 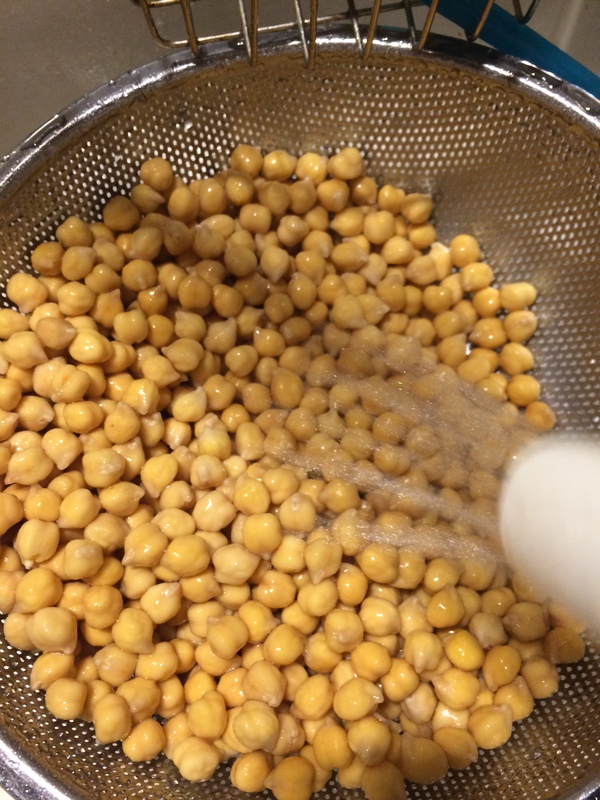 Second … soak your beans! Soaking beans helps to remove the toxins and we’ve found keep the gaseous disturbances to a minimum, the longer they soak the better. As I understand it, 6 hours is minimum, but let’s take it up a notch and go for 8 or 12. If I set a pot to soak before I make dinner, I know it will be certain to have 12 hours to eliminate toxins. Next, drain, rinse and sort again! So, no one wants those toxins making tooting noises later! Just flush them right down the drain, vigorously agitate the beans in your colander and really get a good rinse going. You may need to discard more broken beans that couldn’t keep it together in the long soak. After rinsing put these babies back onto the stove in a big pot with a lot of water and bring the whole thing to a boil, keep a good rolling boil going for 11 minutes, then drain the beans and rinse once more. If I’m planning to be out all day I’ll leave it on low from the get go. We once read that you know when a bean is cooked when you squeeze it and it turns soft in your fingers. Seems to work for us… I test when the low setting has been on for about 6 hours (if we are doing the math, the whole crock pot has been slow cooking for about 9 hours all together). Mostly everything is ready after 8 – 9 hours. Strain with a slotted spoon and serve immediately! If you’re serving the next day, you can cool with the liquid and reheat to serve later, really tasty next day. Or, you can drain the beans and freeze them or refrigerate them as well. Our mainstay beans, the ones we keep on hand all the time are Kidney Beans, Garbanzo Beans, Pinto Beans and Black Beans. 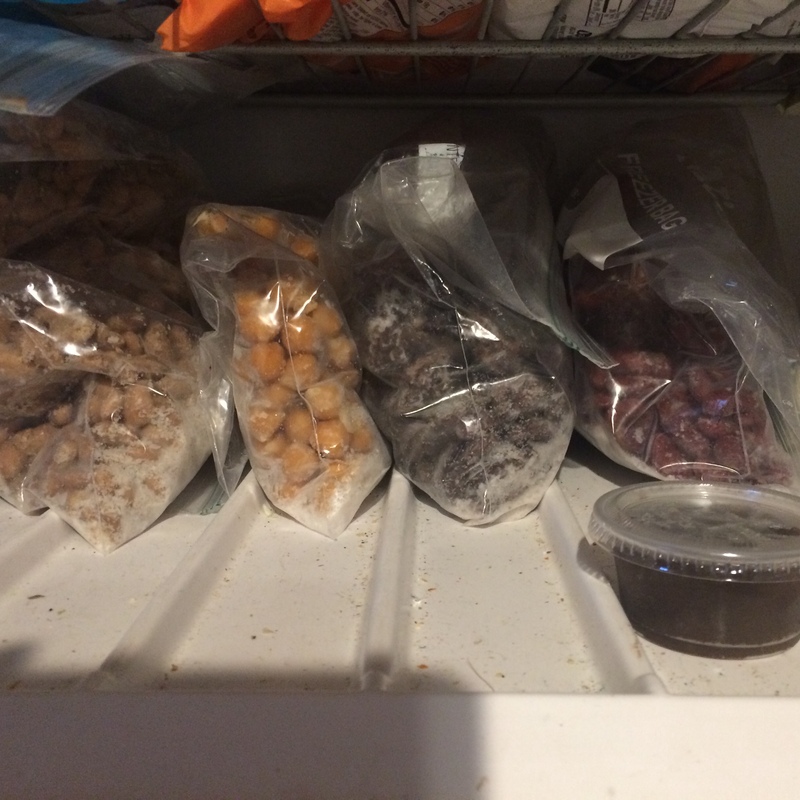 We may experiment with others (40 Clove Chick-Peas), but these four are what you’ll find most of the time in the freezer. 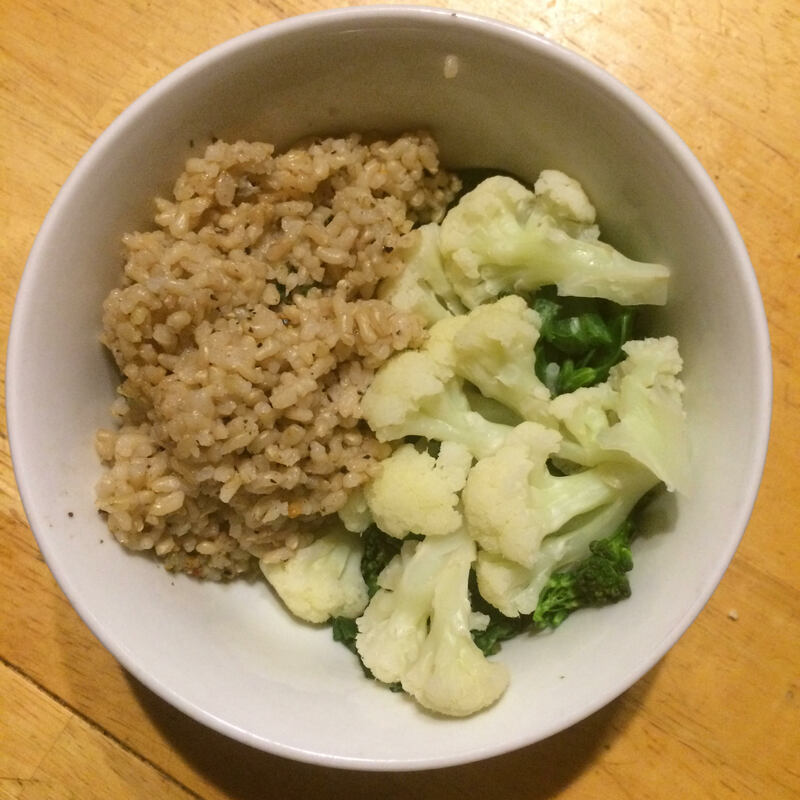 I spice each differently, which makes for some interest when grabbing a handful to warm up with rice and veggies for a standard “monk food meal”. The thing about beans is that they are filling and hearty and still quite humble. I can make them into a quick chili by taking one or more varieties and heating them up with some jarred tomato, salsa and corn — I can rinse to defrost and toss on a salad — add to just about any soup, home made or canned — mash onto toast, as nachos or in a wrap. So easy, so phenomenally good with just so little extra time spent preparing.